Convenient parking is available near Campus Martius Park. Refer to the map for more information on parking or to reserve a guaranteed space. 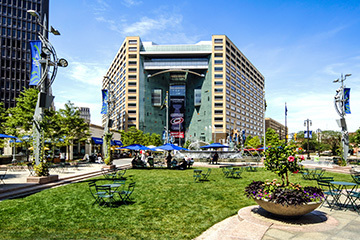 Campus Martius Park is Detroit's signature public space featuring spectacular views of the downtown skyline, along with beautiful landscaping and flourishing gardens. The park offers a variety of amenities, such as free events and programs, several dining and beverage options, an ice skating rink during the holidays, and an urban beach during the spring and summer.